Re:Fresh - Macklemore Hates Jews? Dapper Don Parmesan hosts "Know Your Peeps"
Comedian Breaks World Record for Underwater Somersaults - FAIL! Las Vegas Laugh Factory Apr. 27 - May 3: Don't Hack My Headline! Valentine's Day Grammar-Gram - "Valentime"
Save Water...Pee in the Shower! Re:Fresh - Rihanna's Dress--Yes! Then, No!!! One-Hour Comedy Special - Preorder Now! 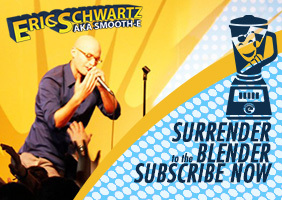 Eric Schwartz - Wearing Glasses, Tappin' Asses (Stand Up) - "Surrender to the Blender"
Eric Schwartz Smooth-E - "Surrender to the Blender"